This seems to be a repeated theme for us these days, but with record rainfall amounts in Harrisburg it is difficult to complete our excavation plans. So the word for the week is RAIN, depsite this we had some terrific events at the The State Museum of Pennsylvania. Our exhibit cases were finished by our master craftsmen in the shop and we installed about 175 artifacts in beautiful new cases. The Fort Hunter exhibit opened in our gallery at The State Museum just in time for our annual Archaeology Month in Pennsylvania which begins tomorrow October 1st. This exhibit provides the visitor with an opportunity to view artifacts from the past five years of excavations at the fort. 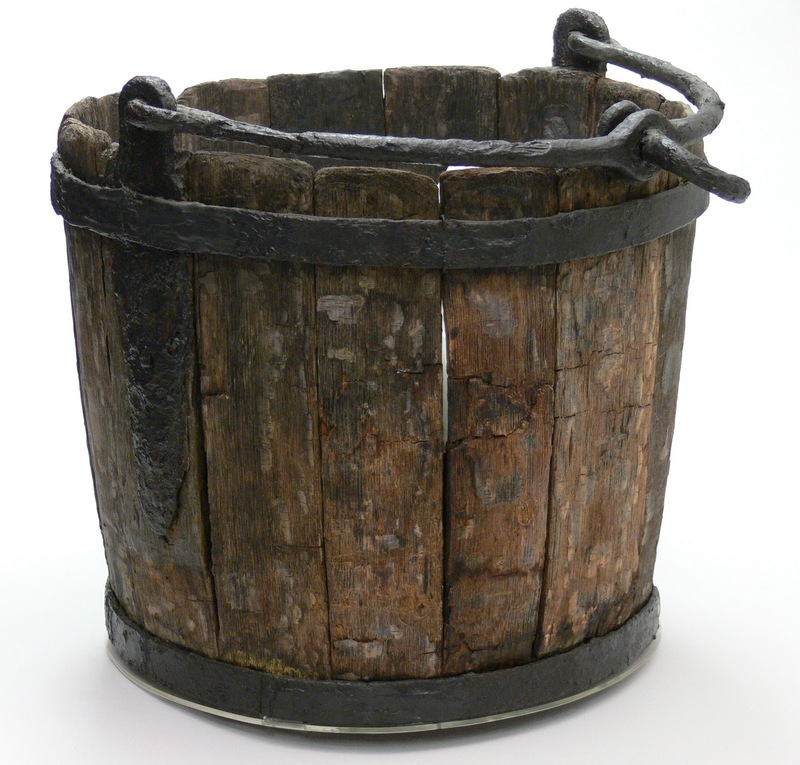 We also have on display a bucket recovered from the well at Fort Loudoun, another French & Indian War period site located near Chambersburg, PA.
Fort Loudoun bucket prior to conservation. Many of the visitors to our excavations at Fort Hunter want to know what we have found and this exhibit provides an opportunity to learn about what we have ascertained from our findings. The exhibit text follows the methods employed to identify the site, the actual excavations and then the analysis which is conducted after we return to the lab. 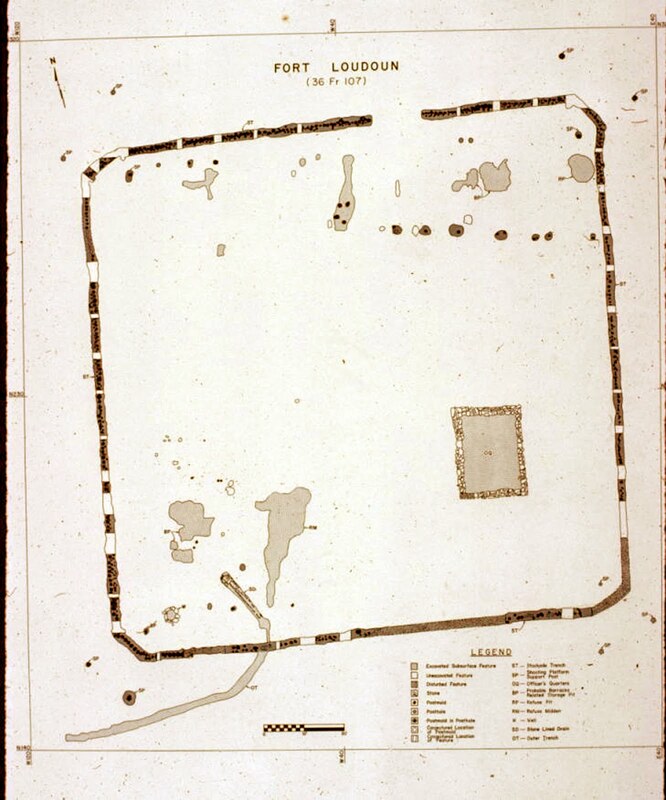 Preliminary analysis of faunal remains provided a glimpse of the diet of soldiers stationed at Fort Hunter and an opportunity to compare daily life there with other French & Indian War period forts. Visitors enjoying the new Fort Hunter exhibit. Our first visitors to the exhibit were students attending Homeschool Day at the museum. This annual event provides educational programming throughout the museum for students and teachers, and has become a popular event. Some of the programs included were planetarium shows, guided tours of the galleries, and mini-lessons from State Museum Curators. Janet Johnson conducted sessions on archaeological techniques and how archaeologists apply these methods in excavating Pennsylvania sites. Home School Day participants gather near the statue of William Penn. Excavations are continuing at Fort Hunter and while progress keeps getting interrupted by torrential downpours, we are managing to continue with our project. The ditch area in the front yard continues to puzzle us. The deep fill deposit continues to produce historic and prehistoric artifacts, but since their provenience is disturbed they provide little information in our attempt to understand the activities of the site. A large fire-cracked rock area adjacent to the well is being mapped and recorded so that we can begin to remove the soils surrounding the well. We don’t want to destroy this large feature when we start excavating further on the well next week. We are counting on the forecast of a dry week and hopefully we will have better weather for the weeks to come. Registration is open for the Workshops in Archaeology and the forms are starting to flow in, don't wait to register as some sessions will fill up fast. Here is the link for the registration form. Despite a dreary week of fieldwork marked by spotty rain showers nearly every day, progress continued at the Fort Hunter excavation this week. Fortunately, the weather cooperated for Fort Hunter Day, this past Sunday. Hundreds of visitors had the opportunity to view the excavation in progress. In the main block behind the mansion, units surrounding the well feature were taken down and a persistent FCR (fire cracked rock) cluster was mapped including elevation readings for each piece. Meanwhile, in the front yard of the mansion a trench excavation was begun to further expose a large feature discovered last year that may hold clues to the perimeter of the fort and its overall dimensions and orientation on the property. In this trench it is apparent that the landscape has been heavily modified. A fill layer directly underneath the modern “A” horizon has yielded a hodgepodge of artifacts from the archaic period (and possibly earlier) right through the late 18th century. Seen below is a sample of the objects recovered from the fill layer in the trench in the front yard. Unfortunately these artifacts were not found in context. The oldest artifact from the trench, a limace, can be seen below. A limace is a thick side scraper thought to be used in scraping hard materials such as wood, bone or antler. They are found on Early and Middle period Paleoindian (11,200 – 10,400) sites, especially in new England and the Great Lakes but rarely are they common on any one site. Just a reminder, for those interested the State Museum of PA will be hosting Workshops in Archaeology Saturday, November 5th. This all day program will feature guest speakers lecturing on a variety of topics of prehistoric archaeology in Pennsylvania. A link to the registration form can be found here. Clean-up has begun at the Fort Hunter excavation site, as it has most places in the midstate following last week’s historic flooding up and down the Susquehanna River. 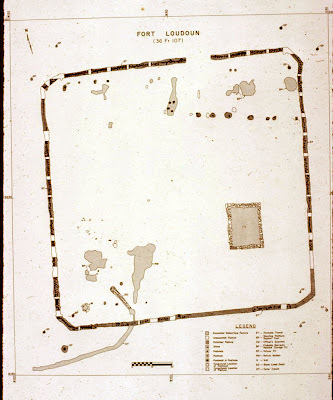 After re-establishing the site grid and outlining the perimeter of the excavation block, the next order of business was to remove the overburden, or backfill, covering the site. This was accomplished with the help of a front end loader skillfully operated by Dauphin County Parks maintenance man Doug Killian. Thanks to Doug for making quick work of the first two feet or so of heavily compacted backfill on top of our site. The heavy machinery was then traded for spade shovels and smaller hand tools to carefully remove the remaining overburden, revealing the layer of plastic that had been laid down marking the extent of last season’s excavation. As this process continues the excavation block walls will be cut and trimmed to be as vertical as possible, and the floor will be “clean troweled” or lightly scraped with a masons trowels to remove any residual accumulation of debris. Once the excavation block has been made orderly and presentable, the actual archaeology can resume. This will begin with filling out an excavation record or “square sheet” for each 5’x5’ unit within the block. Accurate record keeping and consistent note taking are the essential activities that separate professional archaeology from the casual arrowhead collecting or relic hunting. Information to be recorded on the square sheets includes: the site name and number, the northing and easting coordinates of the unit, the beginning elevation or depth as measured from the ground surface or a designated datum point, soil color and texture, the natural soil layer or stratigraphy, the arbitrary level (in our case 3” increments) within the natural soil layer, a notation of any features or artifacts present within the unit, and of course the date of excavation and the initials of the excavator(s). Taking the time to record this information ensures that the context in which artifacts are discovered is retained, and this in turn allows the archaeologist to analyze their spatial relationship to one another after they have been removed from the ground. Beyond the objects themselves, the science of archaeology concerns itself with where things are found, and what inferences can be drawn from their distribution. Without accurate record keeping this type of analysis is impossible. Another rain day has slowed our progress opening the excavation block for the 2011 season, however this Sunday, September 18th is Fort Hunter Day at Fort Hunter Mansion and Park, and the Section of Archaeology staff and volunteers will be on hand to answer questions about the archaeology conducted at Fort Hunter to date and to begin this season’s excavation in earnest. Stop by and enjoy a fun and informative day at Fort Hunter this Sunday. W is for Well, Workshops, Water, and WEATHER! Well at Fort Hunter at the end of field season. We resume the alphabet this week with the letter W and our focus is on the well at Fort Hunter. We intend to continue excavating the well that was discovered during excavations in 2009. We will be bisecting the well and removing the west side, the goal is to remove another six feet. Last season we removed the top six feet of the well which was primarily ash and coal cinder. We are hoping that this fill represents a later occupation and fill event than the fort. We are optimistic that we will find military artifacts dating to the forts occupants. Excavations at other French & Indian War Period sites have revealed a pattern of construction that includes a well within the walls of the fort. 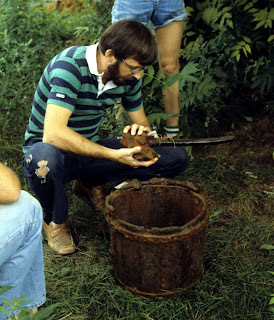 If we are able to date the well to the fort time period, it will help solidify the location of the fort. corner, inside the stockade line. The soils surrounding the well date back 3,000 to 4,000 years, based on pottery and prehistoric projectile points. The presence of fire cracked rock suggests there was a Native presence and that the rocks were heated. Research of similar hearth features points to their use for cooking and processing of foods. Additional testing and research is required to fully analyze this feature. Fire Cracked rock feature near the well. We are also investigating a feature on the side yard of Fort Hunter Mansion and Park which we are interpreting as a possible road. Excavations in this area will be expanded to aid in this interpretation, but the grooved rocks and tracks pictured in the image below are a good indicators of this activity. Do we dare say Wagon Wheels in keeping with our W theme? Possible path or road feature, note the water standing in grooved "tracks". All of these plans are on hold until the weather cooperates. This brings us back to another W word- Weather… Due to the extreme precipitation and flooding, our excavations at Fort Hunter are delayed. We’re ready for the rain to stop so we can roll up our sleeves, break out the shovels and trowels, and go to work! Finally, W is for Workshops. On Saturday November 5, 2011, The State Museum will be holding its Annual Workshops in Archaeology Program. This year the topic is Native American Archaeology in the Commonwealth. There are nine different classes being offered as well as a PowerPoint on Forensic Archaeology and a Flint Knapping Demonstration. Participants may select to attend four classes from an available eight sessions. Topics include the Paleoindian Period, Archaic, Woodland and finally the Contact Period. The day will begin at 8:30 for late registration, followed by opening remarks. Bring in your artifacts for identification by archaeologists and don’t miss an opportunity for a behind the scenes tour of the State Museum Archaeology Laboratory. The Workshops will wind down with closing comments by Dr. Dean Snow entitled “The Contribution of Pennsylvania Archaeology to Our Understanding of Past Cultural Behavior and Directions for the 21st Century.” A wine and cheese reception will close out the day and provide an opportunity for reflection and discussion of the presentations. Look for a link to the brochure and registration information next week- but mark your calendars today for November 5th, 2011. Thanks to our intern from Elizabethtown College, Maggie Keefer for helping to write the blog this week! Look for more information on Maggie and intenships in a future blog. This weekend our staff along with a few volunteers will be participating in the 15th annual Native American Pow-Wow at Kipona 2011. We will be bringing the ever popular recreated dugout canoe, informational brochures on State Museum programs with coupons for reduced admission, passes to the State Museum's planetarium, children's activity worksheets, the hot off the press 2011 Archaeology Month poster, and an exhibit of select artifacts from City Island excavations. We view public outreach as an important responsibility of The State Museum's Section of Archaeology. As a state agency, it is our obligation to get information on Pennsylvania archaeology to the public. We do this through book publications, brochures, exhibits, our web site and this blog. In addition, we do presentations at schools, to civic groups, tours of our Anthropology and Archaeology gallery in The State Museum and exhibits at large public events. For example, partnering with the Society for Pennsylvania, Inc, in mid August, we set up an exhibit using our dugout canoe and a demonstration of our geographic information system at Cabela’s in Berks County. We spoke to roughly 3500 people that weekend. We hope to greet and share our enthusiasm for archaeology with more visitors this weekend at Kipona Fest. Kipona Fest is a huge attraction for South-central Pennsylvania and we are pleased to be able to participate. The purpose of our presence at the pow-wow is to raise awareness of all things archaeological. Archaeology is the only science that can reveal the past prior to writing. Evidence of native peoples discovered through archaeology has yielded important information regarding the lifeways of these groups. Archaeological sites are important non-renewable resources. Once these sites, both historic and prehistoric, are destroyed the link to our heritage which they may yield is lost. Further public outreach programs include the upcoming public archaeology program at Fort Hunter Park. October is Archaeology Month in Pennsylvania, watch for programs in your area, we will post any that we are involved in or aware of on our blog. We will participate in Archaeology Day at the State Capitol in October to recognize the significance of archaeology in our daily lives. We encourage visitation to The State Museum and our websites for additional information on archaeology in Pennsylvania . Come out and enjoy the unofficial end of summer this weekend at the Pow-Wow on City Island!